His close friend Jeremiah Smith, who likened him to the Angel Gabriel, called him “ Gabe”. Others quickly adopted the name, and as time went on it was quite naturally changed to Old Gabe. The Indians called him Big Throat, because of the goiter he had that was caused by drinking so much spring water, or Blanket Chief because of the colorful blanket his wife made for him and which he wore almost all the time. Jim had three wives, although some have tried to add a fourth. 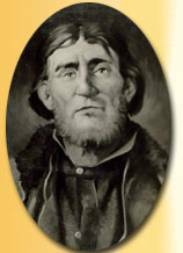 He was first married to Cora INSALA (daughter of Insala, CHIEF OF FLATHEAD NATION (Little Chief or Scar Face) in the spring of 1835 at the Green River Rendezvous Site. 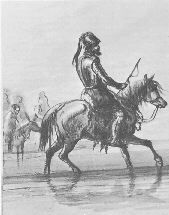 This was soon after Kit Carson married Waa-Nibe, an Arapahoe maiden at the same Rendezvous. Jim probably met Cora earlier, and they knew each other for some time before marriage. Cora INSALA was born in 1820 in Montana Territory. She died in 1845 at Fort Bridger, Unita Co, WY, shortly after delivery of their third child, Josephine in the wintertime. According to Ezra Meeker, one of the earliest Oregon Trail historians, The Story of the Lost Trail to Oregon, as presented by" Patricia Kohnen. Their second child was Felix BRIDGER born in 1841. Their third child was Mary Josephine BRIDGER2 born in 1845 at Fort Bridger, Unita Co, WY. 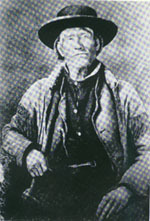 His second marriage was to an UTE INDIAN about September 1848. He felt a need to have someone to care for his children after his first wife died, and after he met the un-named Ute woman, they were married. She was born about 1830 and died on July 4, 1849 at Fort Bridger, Unita Co, WY. She died giving birth to her daughter, Virginia Rosalie Bridger (Jim’s fourth child) on July 4, 1849. His third marriage was to Mary WASHAKIE (daughter of Little Fawn WASHAKIE, better known as "Scar Face") in 1850 at Fort Bridger, Unita Co, WY. After this marriage, Jim and his family moved to Missouri near Little Santa Fe, where he bought a small farm consisting of 375 acres under cultivation and several hundred more forested acres. With the help of a neighbor he built a log cabin for his family now comprising a new wife and three children. Moving with him was: Felix, age 8, Mary 6, and Virginia Rosalie, 1. Mary WASHAKIE was born about 1833 in California. The 1880 census states she was born in California. She died in October 1857. Died in childbirth of her second child, William. References to his birth vary from Oct 1857 to January 1858. The Westport history files states: "Mary Bridger had died in October, 1859, and the children were sent to live with a family in New Santa Fe." Mary was housekeeper for Jim Bridger and his children for approximately two years before they married. They had two children: Mary Ann BRIDGER "Elizabeth" (Jim’s fifth child) born in 1855, and William BRIDGER (Jim’s sixth child) born on October 10, 1857 in Green River, Sweetwater Co, WY. Date comes from 1880 census and IGI records. In 1880 he was living with his father. Jim was a guide for General Johnston at the time of William's birth, and was unaware that his wife had died in childbirth until July 1858. After his final discharge from Army service in 1868, he moved in with his daughter Virginia and his son-in-law. 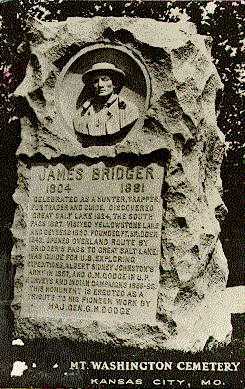 Virginia became the primary care giver of Jim Bridger until his death. 1. Stanley Vestal. 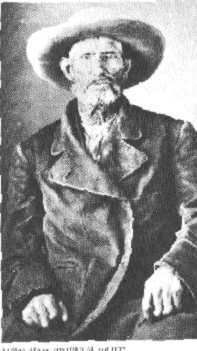 Jim Bridger Mountain Man. William Morrow & Company, New York - 1946. Page 300. 2 – From Years 1823 to 1840. Includes summary of expeditions and origins of local Fur Trading Companies. Maps of several routes. 3 – From Years 1834 to 1873. Recaps chronology not included in the above document for years 1834 to 1840. Copyright © 2003 YGF-Montana . All Rights Reserved.